Do you need help with Easy Social Share Buttons for WordPress? We’re here to help you with questions or issues you run across with Easy Social Share Buttons for WordPress or any of our addons, but we’ll need your help to ensure the best and most efficient support. Please check the following questions bellow. 1) Are You Running the Last Version of Easy Social Share Buttons? We regularly release updates for Easy Social Share Buttons for WordPress. These updates add or improve features or even fix issues with the plugin. Very often the problem you may see appear because you are working on an outdated plugin version. You can check the current latest version on the official Easy Social Share Buttons for WordPress page at CodeCanyon or on the change log page. Ensuring that you are running the lasted version is first and the most important step in troubleshooting. You can learn how to update your Easy Social Share Buttons for WordPress version here. 2) Is Your WordPress Updated? You have the latest version of WordPress. If an update is available, though, be sure to run it. Keeping WordPress core up to date is critical for security and compatibility with plugins. 3) Could Another Plugin Be Causing a Conflict? It may happen that the issue can be the result of another plugin’s code acting outside if its intended scope. The easiest way to track down the source of a conflict issue is to temporarily disable all other plugins and then checking if the issue still occurs. If it does, it means the issue is not caused by another plugin. If it does not occur anymore, that certainly means there’s a conflict with one of your other plugins. You can enable plugins one-by-one and after each checking if the issue occurs. When it does, that means the last activated plugin causes the conflict. Any information you can gather will go a long way to helping our support team to more quickly assist. 4) Is Support Still Needed After Steps 1-3? If you gone through the first four steps but have not been able to resolve your issue, then you are ready to reach out for Easy Social Share Buttons Support. To receive support you need to register an account inside our official support system https://support.creoworx.com. 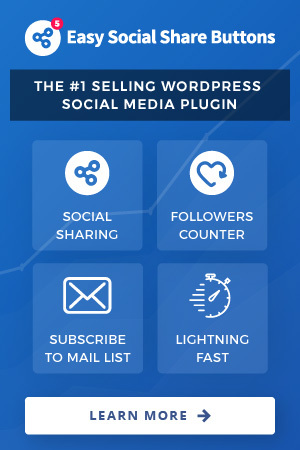 Once you complete the registration you can proceed to verify your purchase in order to access the official support board https://support.creoworx.com/forums/forum/wordpress-plugins/easy-social-share-buttons/. For receiving a fast and speed up reply on your problem please open a new topic and provide as much possible information (and a live link to the problematic post or page will help). Important Note: Official support for Easy Social Share Buttons for WordPress is provided only inside the provided as link support board. Any questions sent outside that board (via mail, comments, contact forms, social channels) may not receive an answer if they are support related. Access to official support board of product require to enter a valid purchase key for Easy Social Share Buttons for WordPress (support period expiration or validity is not tracked – you just need to have a valid key for plugin, no matter when it was purchased).